The position of the course makes it one of the most beautiful golf premises in the country. The town of Mladé Buky was the first place in the Czech Republic to introduce softball and baseball on its playgrounds. To this date, the efforts of these sports clubs have been decorated with many awards and cups won even in foreign contests. In summer, the town provides an excellent starting point for hiking and bicycle trips. Winter months bring an opportunity to go cross-country skiing over many kilometers of maintained tracks. 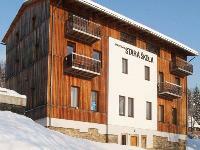 Downhill skiing lovers are invited to enjoy the facilities of a new ski park with artificial snow and night lighting.